The son of artists Fred Klein and Marie Raymond, Yves Klein was baptised a Catholic and dedicated to Saint Rita, patron saint of lost causes, in the same year that Kasimir Malevich wrote ‘The painter is no longer bound to canvas, but can transfer his composition to space’.1 These coincidences seem to set the scene for Klein’s heroic and sometimes tragicomic life and work. Malevich, who was one of the few art historical figures Klein profoundly admired, described himself as an aviator taking art to new heights (strangely similar to Klein’s claims). Klein did not study art but informally dedicated much of his time to the Rosicrucian teachings of Max Heindel and he was a keen Judo expert (the first European to secure a fourth Dan black belt in Japan). Throughout his short life he earned his living by teaching Judo at least as much as he did through his art. Klein paradoxically launched himself as an artist by self-publishing a retrospective catalogue of his monochrome paintings. The preface to this book is by Claude Pascal (the subject of our portrait relief) and consists only of rows of black lines. The reproductions are merely coloured paper tipped in; the dimensions are included without denominations of measurement. The coloured paper may suggest that these are fraudulent, that they are not reproductions, but at the same time they may be thought of as small monochromes in their own right. It was to be typical of Klein that he would make great claims for transcendental achievements and at the same time sow seeds of doubt on the authenticity of his claims. His defining project was the conquest of the void. Klein’s spiritual exercises and his Judo both played a part in this quest, and his monochrome paintings – most particularly the intense ultramarine that he copyrighted as International Klein Blue – aspired to provide a sensation of space and suggest the infinite void. This void for him is replete with spiritual energy. His most controversial act, a seminal example of performance art, was to leap ‘into the void’ from a second-storey window in Paris in 1960. In the photograph by Harry Shunk we see Klein leaping up into the sky not plummeting to earth. His face is yearning up and his arched body speaks of the deep desire for flight, and indeed of belief in its possibility. In 1962 Klein began a project to record himself and his circle of intimates in a quartet of body casts. ‘Portrait relief PR3 (portrait of Claude Pascal)’ belongs to this group, left incomplete at Klein’s death. 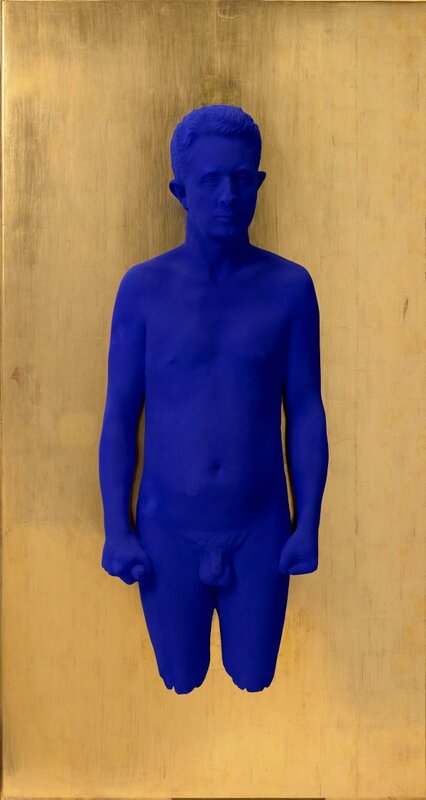 The portrait is cast from the poet’s body and coloured in International Klein Blue pigment. Seeming to levitate in front of its golden field, the figure re-enacts Klein’s ‘Leap into the void’. Klein himself was to have been represented, conversely, in gold against blue but he died before making the cast.